The GAVIK table lamp comes in the original six colours (I take NO responsibility for the pea purée green) together with two additional recols: blue and yellow. IKEA is Swedish after all – and so am I. The lamp can be placed on all surfaces and also on things with deco slots, such as dressers and mantles. 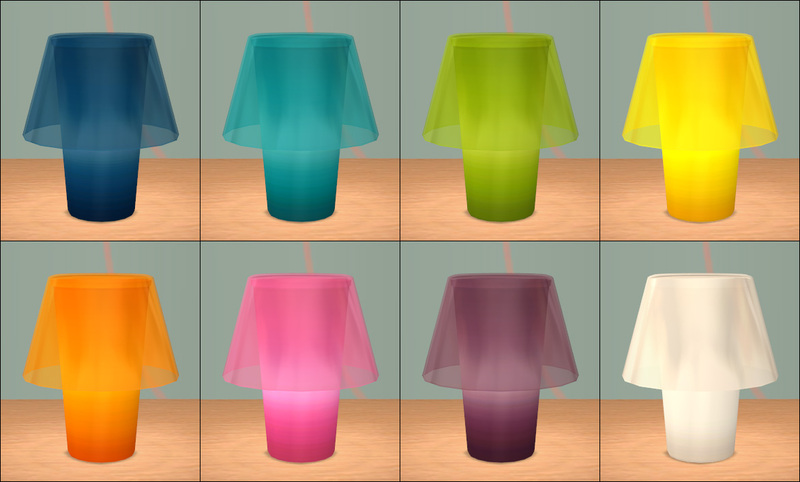 This entry was posted on 29 November, 2012 at 21:24	and is filed under BUY MODE, DOWNLOADS, IKEA Inspired, Lighting. You can follow any responses to this entry through the RSS 2.0 feed. You can leave a response, or trackback from your own site. I know, it was just perfect for Simming. 🙂 I seriously want one for Christmas IRL! Yippee! I was going to go with whoo hoo but that could mean different things to different people lolz. I’m having lots of fun with this lamp, so thanks for the idea! I’m probably going a little overboard with it, but that’s part of the fun. Stay tuned! Sweet I can’t wait to see it! This is perfect!! Thank you!! You’re welcome. 🙂 I’m glad you like it!